The GPI-16 Plus/RJ interfaces 16 general purpose logic inputs to users PC COM or USB port. The user may select from two pre-programmed serial formats; the “PIP” GPI format which is used on most of our audio switchers, or the legacy AT-1616 format. The GPI-16 Plus/RJ has four RJ45 input connectors and can be connected Broadcast Tools COA-37 XDS/RJ adapter using CAT5 cables. 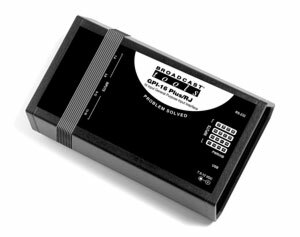 NOTE: The GPI-16 Plus/RJ and COA-37 XDS/RJ are intended to be used together to provide a simple satellite trigger wiring solution from the satellite receiver to the automation computer.